The first day of Kindergarten is such an exciting time, but it can also be overwhelming — for kids and parents! There’s so much to look forward to, but it’s also a really big adjustment for the whole family. If you have a little one who will be making the transition to Kindergarten, or if you’re a Kindergarten teacher looking for a great “first day” read aloud, I highly recommend these books about the first day of Kindergarten. Have a little one starting preschool? 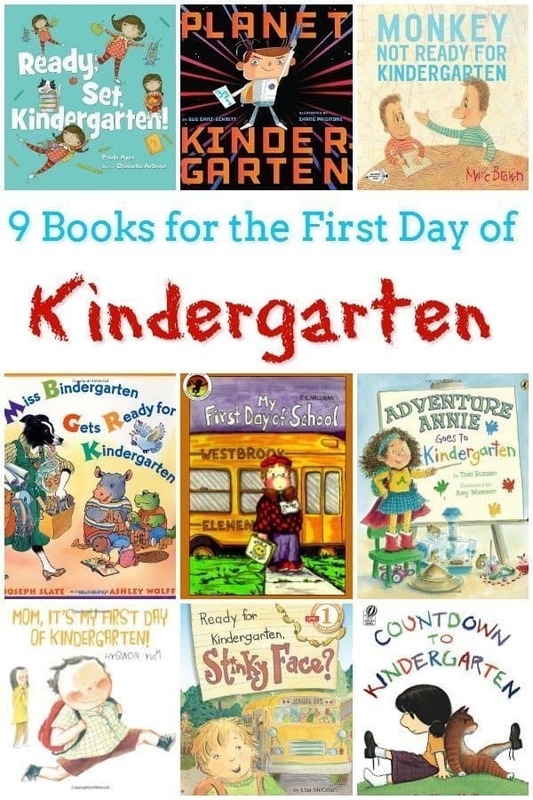 Check out our 7 Books for the First Day of Preschool. Mom, It’s My First Day of Kindergarten by Hyewon Yum – An excited child reassures a nervous mom about the first day of Kindergarten. My First Day of School by P.K. Hallinan – Daniel is nervous and full of questions as he leaves preschool behind and prepares for Kindergarten. Will Kindergarten be fun? Ready, Set, Kindergarten! by Paula Ayer – A young narrator shows all the ways she’s a big girl. She’s ready for the next step: Kindergarten! Planet Kindergarten by Sue Ganz-Schmitt – Kindergarten is compared to a space adventure in this fun and exciting read. Monkey: Not Ready for Kindergarten by Marc Brown – Kindergarten is one week away, and Monkey is NOT ready! This book is great for the nervous or worried child. Ready for Kindergarten, Stinky Face? by Lisa McCourt – Stinky Face is full of “what ifs” as he gets ready for Kindergarten. This early reader is perfect for those who have already started to explore reading aloud with help. Adventure Annie Goes to Kindergarten by Toni Buzzeo – Annie Grace is always looking for adventure, which gets her into some trouble when she heads to Kindergarten. However, she’s able to help save the day when problems arise! Miss Bindergarten Gets Ready for Kindergarten by Joseph Slate – Miss Bindergarten books are a great introduction to the world of school. This first book also reviews the alphabet! Countdown to Kindergarten by Alison McGhee – What happens in Kindergarten when you need help? This book will calm students’ fears about asking the teacher for assistance on the first day and beyond. For more great reads, be sure to sign up for our newsletter!